Peterborough United striker Ivan Toney has won the League One player-of-the-month prize for December. Toney scored five League One goals in the month including a hat-trick at Accrington Stanley. 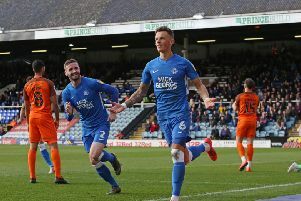 He beat off opposition from Luton defender Matt Pearson, Doncaster striker John Marquis and Portsmouth winger Ronan Curtis. Luton’s Nathan Jones won the manager-of-the-month award. He has since left the club to join Stoke in the Championship. Jason Cummings won the August player-of-the-month award.